Where now for the CAP? In November 2010, the EU Commission is due to come up with a Communication that will set out its vision concerning the challenges facing the CAP. Earlier this year, in April, Commissioner for Agriculture and Rural Development, Dacian Ciolos launched a public debate on the future of the CAP. This public consultation is reported to have received the largest response of any Commission consultation on any issue with a total of 5 700 responses from individuals, stakeholders and research institutes. The consultation was concluded with the holding of a conference in July. A formal public consultation will take place on The CAP Post 2013 once the Commission issues the Consultation on the subject. What lies ahead? The legitimisation of the policy requires a more harmonised level of support. The disbursement of funds to farmers can no longer be based on historical production, which has led to huge differences in support across the old and new member states. Convergence towards some kind of flat rate direct payment therefore seems inevitable. The timing of the change, as well as the extent and manner by which the gap between the status quo and flat rate would be bridged, however, remain open. What can be said with some certainty is that elements of the current decoupled direct payment system under Pillar 1 could be retained. Instead of being based on historical production levels, however, the Commission is likely to present public goods as a new focus for support, proposing that payments could target "non-compulsory environmental services, sustainable services, sustainable farming practices and improving the countryside in high nature value areas". In the face of budget pressures, it is possible that the Commission will put forward the option of direct aids being nationally co-funded. The Commission has strongly resisted this alternative in the past. As to the structure of the CAP, the discussion centres on the relationship between the two pillars, as well as their number. How many pillars should there be, none two or three with the third one being devoted to the 'new challenges': biodiversity, water management, renewable energy and climate change. The Commission's paper, emanating from the 2008-09 Budget Review process late last autumn, actually suggested the creation of a 'third pillar'. This pillar should focus spending on measures to contribute to reducing agriculture's greenhouse gas emissions while also developing the use of land as a carbon sink. On the basis of the July Conference, however, it seems likely that the current two pillar structure will remain for the time being. In his closing speech Commissioner Ciolos stated that Pillar 1 should contain policy measures with the objective of reconciling 'the economic, environmental, social and territorial dimension'. Pillar 2 could again include measures that could be used to 'modernise farms, deploy new support for innovation, promote diversification in rural areas, help the agricultural sector respond to volatile markets and treat, in a horizontal manner, the complex challenges linked to climate change. Nevertheless, the way of framing Pillar 2 has changed. The shift from talking about 'multi-functionality' to making 'public goods' the core rationale for future support is not merely of semantic significance. The open question is whether all actors capable of producing public goods in rural areas will be the target of the policy or whether it will only be targeted at farmers. The notion of 'public goods' seems attractive to many policy designers, even though it remains rather imprecise, namely, for which public goods would citizens in practice be willing to pay, and how much? The debate over the future CAP clearly involves reference to more system-wide approaches than ever before with new suggestions framed issue-by-issue. The Commission seems to expect a lot from quality-food and short production chains, most probably to be supported from Pillar 2. This element would actually pave the way for, and probably require, a broadening of the CAP towards its rebranding as an agricultural and food policy, which has been suggested frequently in the ongoing debate. A new topic heavily advocated in the Congress was subsistence farming along with the issues relating to small farms more generally. Moreover, the political positioning of the CAP within EU politics is characterised by the new composition of both the Commission and the European Union more generally and by the new co-decision procedures as a result of the Lisbon Treaty. Moreover, the proposal of specific targets in the Europe 2020 strategy now underlines specific assets in all types of regions. This is especially important for rural areas. The strategy's approach is to seek to move away from subsidising economic activities in less well performing regions to the promotion of assets in all kinds of areas. As such, the strategy comes to the fore in the discussion about the territorial approach of the CAP. 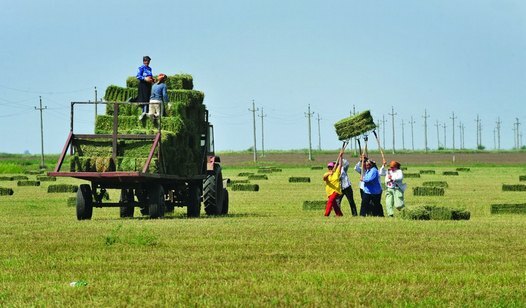 Rural development policy has also drawn closer attention from regional policy makers. As such, there is now growing interest and discussion in the EU over how to bring CAP and Cohesion Policy closer together. The crucial argument in this context relates to the need not just to widen the regional perspective of the CAP but also to enhance its relationship and coordination with other respective policies in rural areas. The LEADER approach enjoys a lot of enthusiastic support among CAP actors despite ongoing problems with policy delivery. It is thus likely that it will be continued in the new version of Pillar 2 to come. In the July Congress it was suggested that Leader and a number of other local approaches should be maintained and reinforced, and perhaps even broadened beyond rural areas. The potential relocation of the present Pillar 2 from the CAP to the Cohesion Policy has also received some support in the current programme period. On the other hand, there is growing awareness that the integration of Pillar 2 into the Cohesion Policy necessitates further evaluation. The current debate has not however sufficiently considered the consequences of this relocation. Arguments against this move highlight the fact that the relocation of Pillar 2 would significantly loosen the bonds between agriculture and rural policy. The possibility of moving Pillar 2 is however often considered positively as it would enhance the consistency of rural development. One crucial argument refers also to the growing and difficult issue of the management of various EU funds. On the other hand another argument in favour of keeping Pillar 2 RDP measures inside the CAP is that the present context has allowed for both a smaller scale approach to be utilised and for the connection to land use to be retained, which would be more difficult to embed in the current Structural Funds approaches. It is obvious that at present both CAP Pillar 2 and Cohesion Policy need to be given more and specific attention in order to comprise strategies which can further enhance integration and support policy coherence. Particular consideration must be given to the characteristics of specific geographical areas and the needs of different types of rural areas. This would also promote the potential to manage funds in such a way that measures are aligned and directed to regions typified as 'most lagging'. The CAP's share of total EU expenditure has long been on the decline. It nevertheless remains the biggest item (at around 42%) of the EU budget while agriculture is far from being the Union's most crucial political objective. There is no universal agreement on the priorities for a future CAP but it is clear that the status quo is no longer tenable, Dramatic and indeed profound changes in respect of this policy are however unlikely. The CAP is, after all, 'a big ship that cannot turn quickly', but it has been perceptively changing course since the MacSharry reforms of 1992, and is likely to continue in this evolution. It is likely then that the 'big changes' are rather more likely to come in 2020. Axis 3: The quality of life in rural areas and encouraging diversification of the rural economy. About Nordregio Nordregio News and the Journal of Nordregio Journal of Nordregio 2010 Where now for the CAP?